One of the most effective tools available to encourage the retention of beginners is a beginner performance. 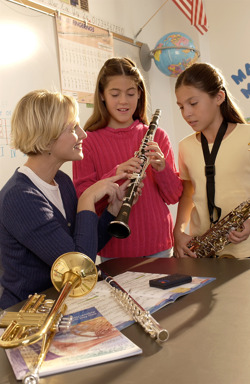 It doesn't matter whether it's a short and simple beginner concert for parents and relatives, marching in the Christmas parade, performing at a basketball game, or playing at the high school band's Christmas concert; the prospect of performing for others is a tremendous inspiration to all beginners. This performance, regardless of how easy the music is or how well it’s actually performed, always lights up parents’ and relatives’ faces with pride. Good timing of the first performance can be a tremendous advantage in retention. Since the novelty of being in band begins to wear off between the second and fourth month, planning a performance for the end of the third or fourth month creates timely motivation. It gives beginners something short term to look forward to and work toward. The weeks just before Christmas are usually an ideal time for a beginner concert. Don't worry about how much they can play by that early date. If they play no more than the first few lines from their lesson book, parents and students alike will beam with pride and you'll be a local hero. Prepare some remarks about what you've been working on and what they can expect in the near future. Take time to recognize outstanding students. You might also pass out, or have the principal or superintendent pass out, achievement certificates in a congratulatory awards ceremony. A cute invitation to the big concert is sure to make parents and relatives smile. 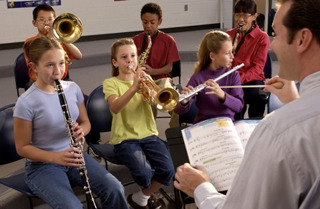 Help parents get ready for the first concert, too! Click here for a great Amro Blog article you can share with band parents.